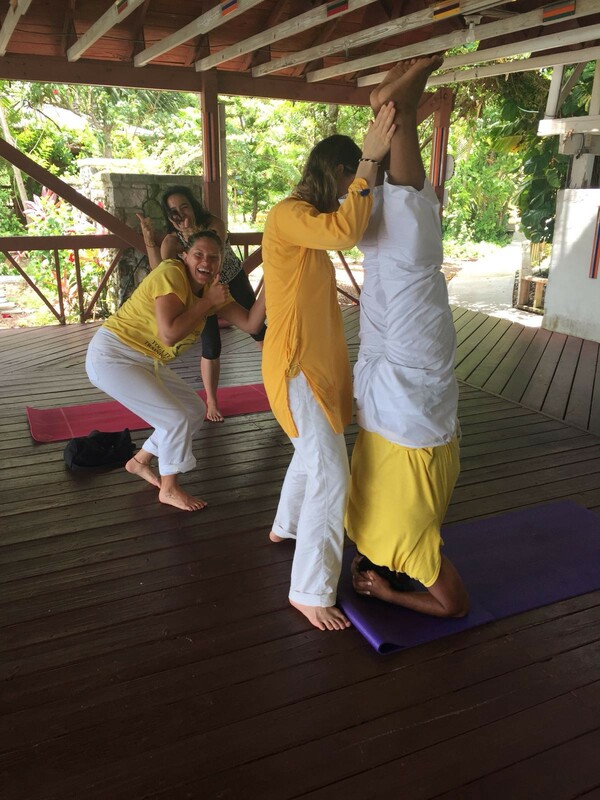 TL;DR: I took a month-long Yoga Teacher Training Course at the Sivananda Ashram Yoga Retreat, Bahamas last month and it was truly transformational. This is my attempt to summarize my experiences over the past month. The course was intensive, with our day starting at 6 am and ending at 10 pm. We had one day off every week. We also had three 1 hour breaks in a day, out of which one break was spent on doing homework, and other for performing voluntary services (karma yoga). That gave us an hour a day for ourselves, which I typically spent on the ocean waters. We learnt not just postures and breathing, but all the eight aspects of yoga (Ashtanga Yoga), along with some Vedanta and Advaita (non-dualism). While I am still transitioning back to the ‘reality and it is too early to say if this will be a life-long transformation, it has definitely changed the way I see things. Here are some of my learning and highlights. Warning: You have been forewarned that this a personal post and it comes with sappiness and vulnerability that usually come with personal posts. Wait, by no means, I have complete answers to this loaded question, but I realized few things about myself which I may not have paid attention to earlier. Happiness is my inherent nature — I now totally agree with one of the teachings that we are all inherently Blissful. We tend not to see that, or to seek that externally. Going into the training with lots of things happening in my life (barely getting over the loss of my dad, what appears to be a mid-life crisis, a practically non-existent marital relationship, being unemployed, etc. ), I was scared that I am going to be miserable. But I was truly happy, almost always. Yes, I was missing my kids like hell, the course was intense, I had issues with my lower back, but I was happy. I questioned myself many a time that if I am just pretending to be happy, ignoring my deeper emotions by keeping myself busy with work and bantering. But the day of silence gave me the answer I was seeking — happiness is my inherent nature and I don’t need to seek that from others. I am happy in the company of friends, but I am also happy all alone, silent, and to myself. I also had an epiphany a few days later, that I don’t external sources to make me happy. Since then I have come to realize that one has a choice to be the inherent happy self or not. I love Selfies! If you have known me from the technology side of things, you might have noticed a lot of Selfies in my twitter timeline. I kept doing the same, so much that my friend commented the day she was leaving that I am crazy about Selfies. I jokingly said that I love taking pictures of myself. Not at all — less than 2% of my photo collection has me alone in the selfies. Selfies are my way to appreciate the moments I spend with those that I love and respect for who they are, irrespective of what they are. Those few lonely selfies are for reporting back to my family. Our Yoga instructor is a perfectionist, but he never pushed us to a perfect posture. He would challenge me while trying one-one-one, but never in a group setting. He taught how to seek perfection by raising one’s limits gradually, than by pushing. I still don’t get on to the headstand without help, but I improved from barely getting on to keeping my head down between hands, to coming to the complete posture with some support. Had I pushed my limits on day one, I would most likely have hurt my neck ending up worse than where I am now. If only we could apply this ‘raise, not push your limits’ in tech! When asked about the secret to perfect postures, our instructor caught our full attention by saying he has not one, but three secrets — ‘Practice, Practice, Practice’ :). How true! Often we tend to look for complicated solutions or shortcuts, but plain, simple solutions always win, don’t they! We were asked not to compare ourselves with others, but follow our current state of the body. We were asked to listen to our body and to learn to differentiate discomfort from pain. Discomfort is my mind saying ‘Gosh, I feel like not doing the next round of Sun Salutation’ vs pain being ‘my hamstring hurts when I try to reach out to my toes in the Seated Forward Bend pose’. In the first week, I found myself often looking at others to see who is doing better and I wanted so bad to ‘get there’ soon. If you are like me, you most likely would have compared yourself with that perfectly sculpted Greek God/ Goddess in your Yoga class who can get on to any posture at ease. Maybe, you regretted some of your past health style choices. Maybe, you would try pushing yourself in the next posture hard. Or you might have chosen to continue with the class to provide comic relief to others. Humans are competitive by nature — that we know already and that which is supported by numerous studies. We are constantly compared with a ‘peer’ group from day one of our lives, for reasons both good and bad. I am not sure if this inherent nature of ours can be changed or it needs to be quelled, but is it possible to turn in this into something more inward looking? Can we be our best by comparing ourselves with the best version of ourselves that we strive to be? I don’t have definitive answers, but intuitively believe that we can. It may even be more effective overall, in terms of the metrics that we typically use to measure ourselves. I started taking one pose at a time, and by being my then-best (local optima), I could see myself getting better overall — my flexibility, stamina, concentration, awareness of discomfort vs pain, all have improved. I have lost about ten pounds in a month. I was out of coffee (something that I thought I am addicted to) for one whole month yet somehow didn’t rush at the first opportunity to gulp one at the local Starbucks. Do I have a flat ab, hell no! But I am a lot better (global optima) than what I was a month ago. I used to make self-deprecating jokes around my age and how old do I look, maybe as my passive-aggressive way to cope up with getting older. But this experience has revealed me time and again that age is just a number. In our class, we had students ranging from 18 years old to those in their high 50’s. Some of the best headstands were done by those in their 50s. We had two mom-daughter pairs, with both mom and daughter both being their best. The 18-years-old, whom we fondly called as ‘the baby’ of our class, amazed me with her maturity and views on diversity, equality, seeing and doing the best during difficult times, etc. The mom with a 20+-year-old daughter could do advanced variations of poses that many of us could barely attempt. My friends in their 30s all looked so beautiful and young, I couldn’t have guessed their age to be more than mid-twenties. I also felt young to be back in a classroom setting which reminded me of my college days. I was my younger, more immature self: one making jokes (at times stupid too) always, being curious, both shy at times and intrepid at some other times, having a sense of feeling not limited by physical limitations, and even having a crush :). I now firmly believe that age is just a number — growing old too, like growing up, is optional. Don’t believe me? 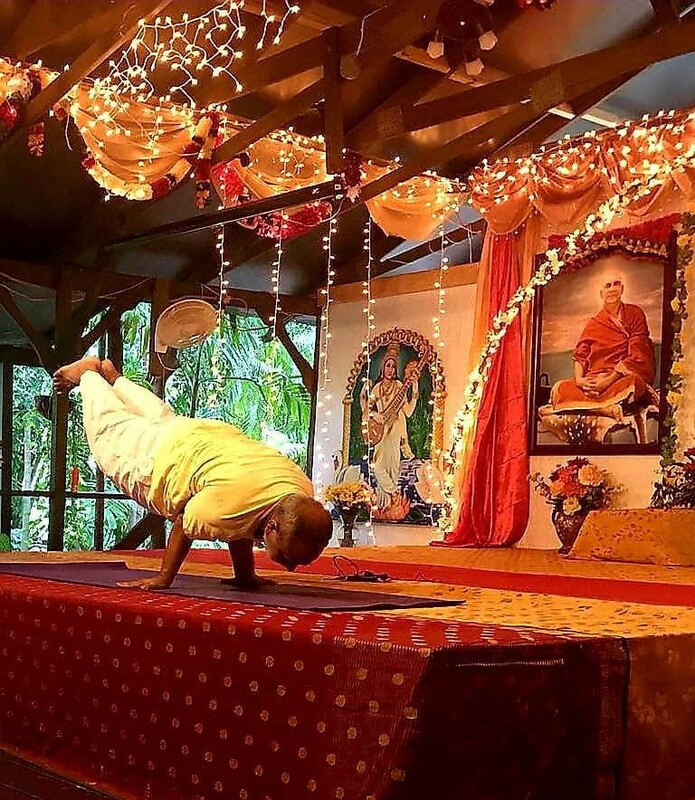 See the picture below, of the priest at temple in the Ashram doing one the most difficult balancing poses. The temple priest doing Mayurasana, the peacock pose. Ain’t age just a number? 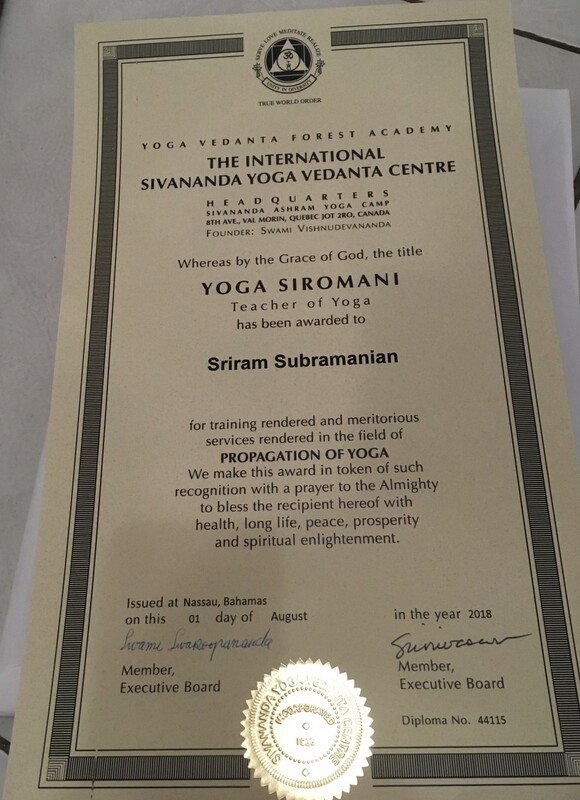 Our philosophy teacher, whom we fondly addressed within ourselves as Swami Nana, would have us sit for a couple of minutes at every class, to think about any moment in the past when our hearts filled with gratitude, towards anyone. This seemingly simple exercise had a profound effect on me. Various studies also show that expression of gratitude has a lasting impact at workplaces. my kids, without whose sacrifice of being away from their dad for a month, I couldn’t have done it. my mom, for inspiring me to pursue the Yoga Teacher Training. She got her Yoga Teacher Training certification last year, despite recovering from the grief of my dad passing away. She has been teaching Yoga to women in her neighborhood since then, for free. mother of my kids, for holding up the fort for a month while working full time. I hope I can be more kind to return such a gesture soon. her parents, for helping her during my time way. my brother and my sister, for their constant encouragement. the entire class — for being there for each other. We all learned from each other. A-AI, for the daily swims, her listening ears, teaching me how to float, and more. EG, for showing me how to be humble and down-to-earth, for putting up with my silly jokes, inspiring me on headstands, being fiercely independent all the while being there for others. LB, for her listening ears and the practice sessions. FJ, for her listening ears, sage words of wisdom, and pointing me how two people can love each other without having having to be in love with each other. GK, for being my Krishna, a catalyst, and his words of wisdom. SY, for Rumi quotes, intro to Sufism, and her musical and serene presence. FO, for showing me how to see positive side of things in any situation and how little things matter. Little S, for her unconditional love and her mom SJ, for her listening ears, encouraging words, and trust. the swim group, for including me in the daily swims and treating me as one of their own despite me being the only guy there. I am truly honored by the trust they had on me. the ‘party gang’ (you know who you are :)), for the fun at Satsangs. the Yoga practice group (LB, SC, and JL), for their support and words of encouragement. the Badass study group, for that wonderful, productive study session. the karma yogis, without whose service (seva), the Ashram wouldn’t run. GD-N, GD-C, and the entire production crew, for making me feel at home from day one during my karma yoga sessions. GD-C, for being there, listening to me, and trusting me. GD-C is such a sweetheart behind those tough looks :). GD-N, for being there, listening to me, and her kindness. A the poet, for sharing his experiences and poems, and his kindness . JL, for capturing my headstands and giving me more confidence to swim. MP, for herding the cats throughout, getting things for our thank-you gift, her company on the way back and listening ears. MB, for her cheerful disposition and the beautiful thank-you card to the instructors. JS, for being the resident physician, always encouraging, and being assertive about your convictions without proselytizing. JM, for her warm hugs and constant words of encouragement. PKG, for capturing my headstands and tips on negotiation. Krishnan Namboodri, the Ashram priest, for helping with my monthly rituals remembering my dad. and more that I am missing here. I also learned that one’s emotions and relationships need not be two way — one can always be friends with or love another person without the need for the other one to reciprocate. I re-learned the virtue of humility during this course. My middle-class upbringing in India had instilled in me these values growing up, but the emphasis on individuality and self-expression here in the US had me confused. Our instructors would always attribute their success to their gurus/ teachers. While it may appear to be sycophancy to just obey your teachers/ elders without any questions, I could see the how such humility can overcome one’s ego. I also learned from some of the friends/ classmates, who were down to earth despite being so successful in their respective fields, that one can be assertive, independent all the while being humble and down to earth. One of the core messages that Swami VishnuDevananda wanted the Yoga teachers to propagate was ‘Unity in Diversity’. After all, aren’t we the same irrespective of our skin tones, gender, languages, body structures, and anything else we may identify ourselves with. All paths lead to the same, and we are all complete. When one comes back to the ‘real world’, from such retreats, it is always hard. I loved the pragmatism expressed by our instructors about the amount of time we would realistically spend on continuing the practice once back home (on the last day, they asked us how much time we plan to spend everyday and asked us to cut that into half :)). I also liked how they asked us not to make any rash decisions (don’t quit your work to become full time yoga instructor, don’t get a divorce to renounce, etc. ), but take time to internalize. The final piece of advice was not to go with the flow. While this might appear counter-intuitive after all the lessons on Karma, but I realize that one determines one’s own destiny by choosing how to respond to situations that one faces. I am going to be realistic as well. My first order of things is to find my next job and sort things at the home front. Next, I want to start teaching Yoga (part-time) to kids, starting with my kids. I would also like to research more on the effectiveness of some of the techniques/ practices (like breathing) in tech/ corporate environments.